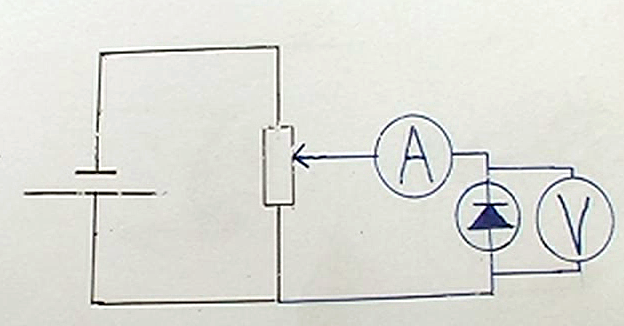 A diode will only conduct electricity in one direction (see diagram). And it will only conduct easily when the potential difference reaches a “threshold voltage” of about 0.7 volts. 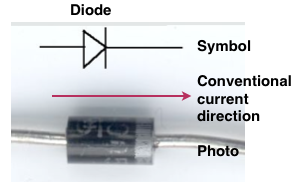 The most common use of a diode is to allow an electric current to pass in one direction and to block it in the opposite direction, that application is used to “rectify” an alternating current. Most modern diodes are based on two semiconductors of different types, usually manufactured from p and n type semiconductors. They are manufactured from one piece of silicon, doped differently at each end. 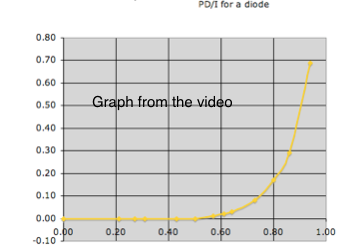 If we test a diode by applying a gradually increasing potential difference and measuring the current flow then we find that the diode does not obey Ohm’s Law, if it did this graph line would be straight. 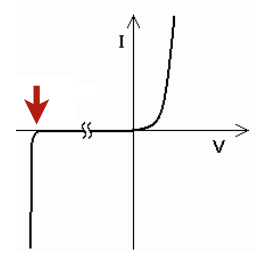 At high values of reverse PD the diode will conduct, usually destroying the component. 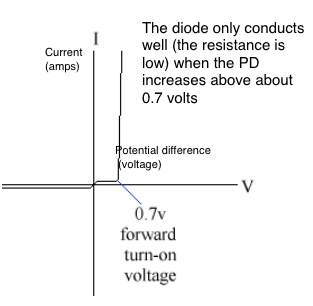 If the PD is reversed and raised the diode will break down, typically at around 50 volts.